Velakali is a ritual art dance form of Kerala India. It is an temple art i.e is presented in the temple courtyards during festival times. Among the martial folk arts, this is one of the most spectacular and extremely vigorous dances performed in Kerala. Extreme dedication and continuous practice are essential for this form of art. 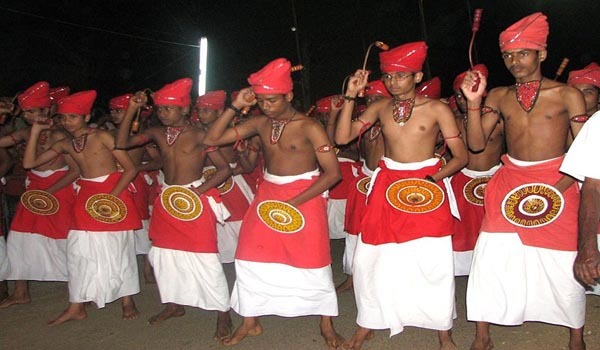 Many of the dance forms of Kerala requires practice and concentration. Velakali originated in Ambalappuzha where Mathoor Panicker, chief of the Chempakasserri army, promoted it to boost the martial spirit of the people. The dance form is a regular feature of the annual festivals at the Ambalappuzha Sri Krishna temple in Alappuzha district. The performers, clad in the traditional clothes and colorful headgear of the medieval Nair soldiers, engage in vigorous movements and dexterous sword play, to the accompaniment of an orchestra comprising the maddalam, ilathalam, kombu and kuzhal.The dancers are in fabulous attire with a conical head-dress, with the cone pointing to one side and beading of jari work at the lower edge. Their chests are covered with beads and other types of garlands. Many of the body postures, choreography and foot work of the Velakali characters are taken directly from Kalarippayattu which is One of the oldest fighting systems in existence.